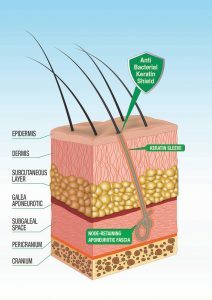 Implantation of Biofibre® – Biocompatible Artificial Hair produced by Medicap Italy, correctly performed by an Experienced Trained Physician on a Suitable Patient, is a simple, safe, soft surgery procedure for baldness solution or hair thinning remedy that guarantees maximum satisfaction both to the physician who carries it out and to the Patient who benefits from it. In accordance with CE Requirements, Medicap organizes in Exclusive personalized Qualification Trainings and Master Trainings onto Automatic Biofibre® Hair Implant System and Biofibre Hair Implant® technique. Biofibre Training are held by a specialized Medical Team at Medicap headquarters (Italy) or to Medicap’s distributors with the presence of one Medicap tutor. 2. a large practical, hands-on part, which will be developed first by using simulators and subsequently each doctor attending training will practice on patient “live surgery” to properly provide worthwhile alopecia remedy or hair thinning solution to his male and female patients. Correct management of the result after the treatment. to the physicians who have proved they can correctly perform hair implant procedure. Medicap training is the shortest and most complete way to get an in-depth learning of the Biofibre Hair Implant and Automatic Biofibre Hair Implant System therefore ensuring the patients an optimal expected result.